According to evolutionary theory, comets are supposed to be the same age as the solar system, (approx five billion years old) they would had to have formed at the same time with the same stellar material. Comets are known to be primarily composed of rock, ice and heavy metals. Astronomical observation reveals each time a comet orbits close to the sun, it loses so much of its material due to many different factors including the solar radiation blasts from the sun. Known this information, we can calculating a uniform loss over the centuries, and have concluded that most comets could not survive much longer than between 10-100,000 years due to the sheer loss of matter from its solar orbit . Stellar Evolutionary beliefs state that the solar system was created by compressed gases and materials that formed not only the planets and sun, but the comets as well. Stellar evolution has no account for comets continued existence, as is currently present in our solar system. If our solar system was older then 10,000 years, the only explanation that would be able to account for any comets existence is a presumed, theoretical Oort cloud. 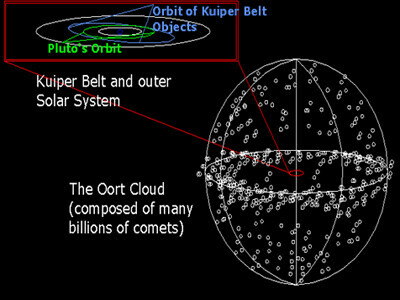 This proposed Oort cloud is the theoretical ‘fuel supply’ for the comets visible in our Solar System. Each time a comet exits our Solar system, it supposedly picks up more mass form this Oort cloud, and is able to continue its cycle. Experimentation, calculation and observation all reveal that comets have typical ages of less than 10,000 years. The Old Earth Theory (Billions of Years), by our current time, would have used up all of its fuel, and of the comets material supply should have ‘leaked out’ and exhausted by now. 3.) Other improbable interactions with planets slow down the incoming comets often enough to account for the hundreds of comets observed. So far, none of these assumptions has been substantiated either by observations or realistic calculations. Lately, there has been much talk of the “Kuiper Belt,” a disc of supposed comet sources lying in the plane of the solar system just outside the orbit of Pluto. Some asteroid-sized bodies of ice exist in that location, but they do not solve the evolutionists’ problem, since according to evolutionary theory, the Kuiper Belt would quickly become exhausted if there were no Oort cloud to supply it. Interesting that as large as this cloud is supposed to be, no evidence exists for it. Studies of the orbits of long-period comets, which are believed to have originate in the ‘Oort Cloud’, presume that the Cloud extends from a heliocentric distance somewhere between 20,000 to 100,000 AU, it would have a peak density of objects at 44,000 AU from the Sun. With all astronomical observations throughout history, and even with the advancements in technology today, this Oort cloud has yet to be discovered. This fact leave in question, something that should have easily been discovered considering the proposed density the Oort cloud would need in order to maintain the mass of each comet for billions of years. It would seem much more probable, the Oort cloud doesn’t exist, and the scientific evidence more accurately fits, a young solar system model that has existed within the time frame of approx. 10,000-100,000 years.